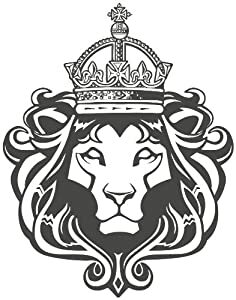 Symbol: A Lion with a crown on his head. Appearance: Standing at 5ft 3 in, and weighing in at 158 lbs, Leona has short pale strawberry blonde hair that goes ends at the bottom of her neck. She braids a strip across the top of her head in headband fashion every morning. She has big round royal blue eyes and naturally brown eyebrows. She usually wears a black infinity scarf that doesn’t get caught on things. She wears a pink shirt under a white jacket with her symbol on the back, black gloves, black flared skirt, and black and white boots. History: Mountain Glenn was Vale’s first serious attempt at expansion. Leona’s parents took advantage of this in their careers, thus meeting by chances during the construction of Mountain Glenn. Her father, Kale Koningsblauw a huntsman, and her mother, Sun Petunia a construction worker. He would be stationed where she was working and would keep an eye out for her while she was working. But Mountain Glenn did not have the natural barriers that Vale did and the Grim attacks became inevitably worse every day. In a last-ditch effort to stave off destruction, the citizens of mountain Glen took shelter underground and eventually sealed themselves from the surfaces entirely, so it would seem. One day, Kale was called for a mission in Vale, leaving Sun with baby Leona. He was on the train back from Vale, the conductor stopped the train when they saw a swarm of grim in the way of the train tracks. He and his team quickly took charge and took the gim out but when they traveled on they found that their homes have been ravaged by grim. Unbeknownst to the citizens of Mountain Glenn, they missed a cavern where subterranean grim could come in through. Leona’s father ran as fast as he could to his home only to find a grim feasting on Leona’s mother’s corpse. Leona’s father killed the grim and saved Leona and took her back to Vale. Once back in Vale, Kale took Leona to her aunt, his sister, Toffy to be ‘raised like a lady’. While he buried his grief in his work. Toffy did not like having to take care of Leona along with her own kids, but she did a reluctantly good job at it. Toffy was married to a wealthy man who was rarely home due to his constant business trips. She taught Leona how to dress and how to act in polite company. Kale would always visit Leona on her birthday and sporadically between throughout the year. She loved to hear his tales of hunting grim the danger and excitement in the world. Then he would teach her hand to hand combat in the backyard. Thus making her more excited to become less ‘ladylike’ after every visit. Leona grew up as a bright young kid along with her three other cousins, which she would eventually need to use what she learned against them. She was fascinated by how dust worked and dust technologies. When she became old enough, she begged to go to combat school. Toffy allowed and after a large fight with her father that left everyone in tears, he relented and allowed her to become a huntress. She joined Signal academy where she unlocked her semblance during training, and built her weapon. She was quickly known as the super polite girl by her peers. Personality: Leona is hopeful in the best outcome, and always looking up in the worst situation. Bing raised with the wealthy, she is quite the debonaire. Known as the overly polite girl by her peers and teachers at Signal. She is charming and outgoing. Though she is hopeful and always looking up. If someone asks her if she’s an optimist, she’d answer with she’s a realist. Meaning she looks at reality and takes it how it is, though she does so optimistically. She enjoys embordering dust into patches, scarves, and gloves, and gives them to friends. She always feels wired when she talks about Mountain Glen because she wasn't old enough to remember living there or the whole 'mother's death' thing. She get's quiet when she's asked about it because there's no real upside to that topic. She also enjoys video games and has a big sweet tooth. She loves to bake but has a bad habit of burning things. Aura and Semblance: Leona’s aura is royal blue and strong. Her semblance is nicknamed “Only Up”. Her “Only Up” semblance works when she lays her hand on an item and coats it in her aura. She then has to be 30 feet within range of the object for her to 'work her magic'. She can them lift her arm in a sweeping motion and cause that item coated in aura to lift 30 feet in the air. She can't lift anything that has an aura or any grim. Thus any gear on an opponent, won't be affected by her semblance. When used with dust she can create pillars of either ice, fire, or earth depending on what dust crystal she uses. Combat Behavior: Leona fights well in hand to hand combat. Not as good as a huntress, but better than your average adult. She loves to use dust with her semblance to make coulombs to hind behind and shoot around and tries to force them to come to her. Then she gets close up to her opponent and tries to disarm them either using her semblance or using her hand to hand combat skills. She tends to go 'all in' once she either she or her opponent gets close enough to her to melee. She has trouble fistfighting against other melee weapons unless she disarms them. She needs to work on how much aura consumption she uses in a fight, too so she's not always worn out after a fight. Primary Form: (Roses) It is made to look like an inconspicuous, long black glove with pink roses embroidered on it, with a crystal slot on the palm of the hand. Dangling around Leona’s wrists are different color dust crystals that she can clip into her gloves. She uses these dust crystals powered gloves to create the columns of either of ice, dirt, or fire. Secondary Form: (Guns) She has two small hidden pistols in the sleeves of her jacket/ on her gloves. They fire .22mm rounds. Dust Functions: Though she has a ‘gun’ function, she only uses regular bullets for ranged attacks, and dust for her combined semblance attacks. Earth Dust: Earth Shield. She creates a column of earth that lifts up from the ground to the max of 30 feet. Ice Dust: Ice Spire: Makes a column of ice that lifts up from the ground to the max height of 30 feet. Fire Dust: BLAZING INFERNO TORNADO: Creates a fire vortex rising as high as 30 feet. History: Made originally for Leona to just make spires with her gloves, she modified them to add a ‘gun’ function for ranged attacks. First off welcome, see you have found everything easy enough so I'll just get straight into the review. Firstly a minor point about the weight, 188lbs is pretty heavy for 5'3 girl. If that's what you are going for great but just as a heads up if you want to keep it you might want to specify what exactly that weight it. Most everything else seems fine although I would personally like some more detail in the ... well personality but it's enough for your first character. Two things on the combat behaviour, firstly as Aura coats your weapons them being fragile isn't really a weakness because that only applies after Leona's aura would have broken so I would like another weakness. Secondly if her semblance can only lift 60kgish it would be rare for her to be able to lift anyone. Is she pulling weapons out of peoples hands? Or is it simply the upward force throwing them off balance.